After being in my to do pile for over a year, I finally made the layer cake crinoline. I followed the multimedia tutorial from Gertie's New Blog for Better Sewing. I used half a yard of bemberg rayon, and half a yard of cotton organdy, both in hot pink! It was super easy to put together, the hardest part was trying to iron these fabrics. The rayon does not want to be ironed. I had a bit of a mishap with my serger and caught more organdy than needed to be serged. Oops. So I took a break halfway through gathering the organdy, and went shopping with the friends. Guess what I saw, the crinoline hanging in the Kate Spade store. 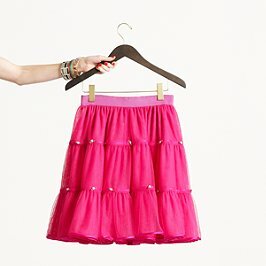 This is made from tulle, but the same exact color, with the same effect. It also cost $195, and made entirely out of polyester. I think mine may have cost $16 including the elastic. I will definitely be making more of these. Thanks Gertie! Gah! I love your shoes!! Ooh, I just love that color! Looks fabulous! Take that, Kate Spade. That color is so bright and cheerful! and I Love the valentine cardi as well! Oh, I hate crinoline -- I think it has to do with the memory of trying to use the restroom wrapped up in a zillion layers of it under my wedding dress! :) Yours looks lovely, though.